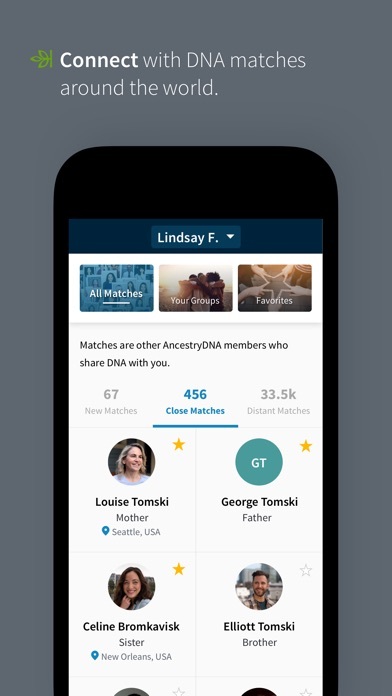 Download the FREE AncestryDNA® app today and access the #1 selling consumer DNA test (DNA Kit purchase required). 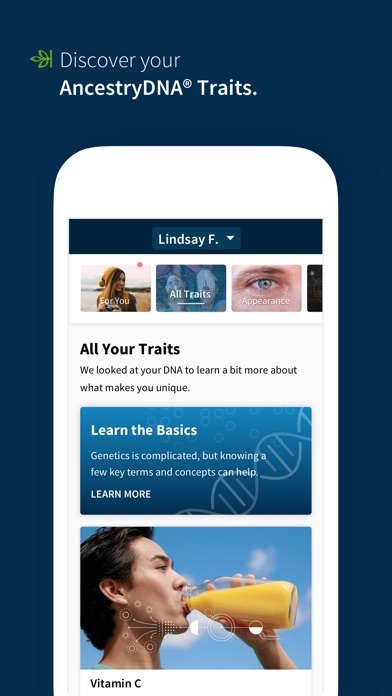 Start the journey to learn about your family story using some of the most advanced DNA science available. Discover the unique family story that only your DNA can tell with a genetic test from AncestryDNA® , the world’s largest consumer DNA database. With a simple test, you’ll get meaningful insights into who you are and where you came from and find new relatives who share your DNA. 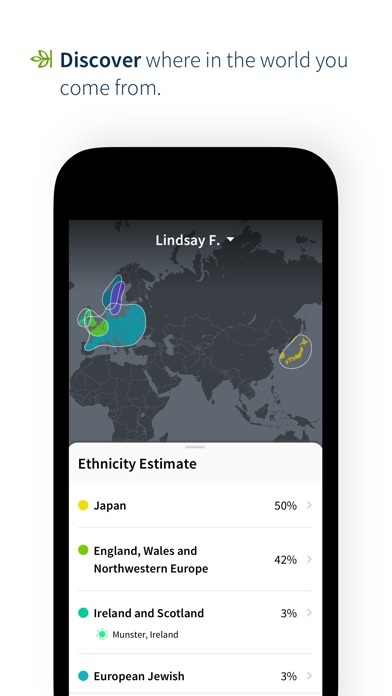 With the AncestryDNA® app you’ll get: • Detailed Ethnic Origins - AncestryDNA® doesn't just tell you which countries you're from, but can also pinpoint the specific places within them, giving you insightful geographic detail about your history with over 500 unique reports. 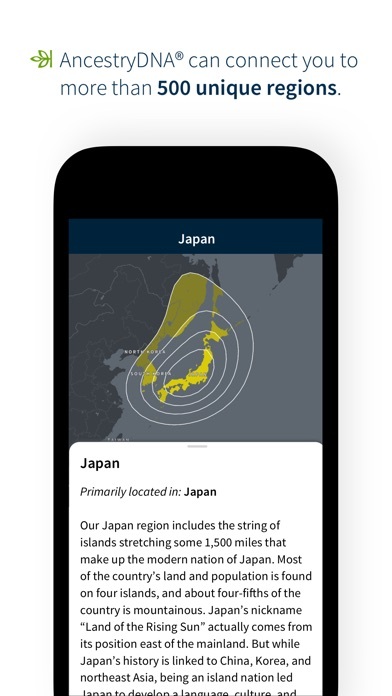 • Communities - Go deeper into your story with more specific details that connect you to the people, places, and migration paths in your family history, all from your DNA. 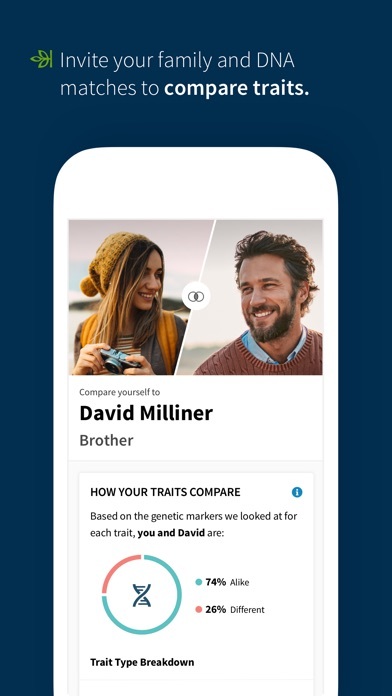 • Family Connections - You could discover a 3rd cousin for the first time by finding living relatives who share parts of your DNA. • AncestryDNA® Traits, now with nutrition traits – Discover 26 fascinating traits your DNA influences. Get the inside story on traits you can see, like freckles—and things you can’t, like how your diet, environment, and genes may influence vitamin levels. Purchase AncestryDNA Traits with a new DNA kit or as an add-on to an existing kit. • Easy to get started - Simply take a photo of the barcode in your kit, follow a few quick instructions to activate and you’re done. 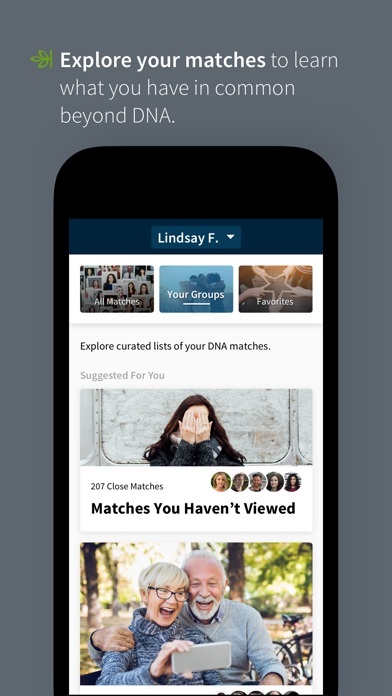 • Simple sharing - Show off your AncestryDNA® results anytime, anywhere, including on your social networks. 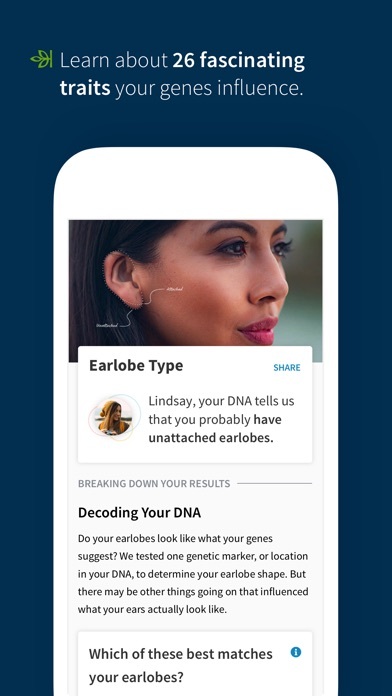 • Notifications - You’ll always know what’s happening during your DNA test with status updates. • Purchases - Buy an AncestryDNA® test for yourself or gift a test to family or friends. App: Easy to use,navigate, quick activating the kit is easy and dummy proof. Less than/about 3 weeks to get results during promotional period. Purchased 3 kits and sent on different dates to get an average idea of process time. _______________ Results: nothing life changing or astonishing. If you know your parents, grandparents, and have a somewhat idea on the evolution of mankind or a sense of migration, war, and the slave trade, you’ll better understand why you have certain regions in your dna. It can still be fun to do with family members. _______________ Con on region results: North, Central, And South America are in one region for example. Might not be as helpful for someone who has a dad from N. America and a mom from S. America. It’s not going to be 50/50 or close to it (because of European & African in them), but your half might be even less because together your parents are 30-40% total of this region. It’s been 2 weeks and the site is not not up and functioning correctly. I got a message stating update will be done soon apologies for the delay. I add people to my tree and I login in the next day and they are gone. This has happened 4 times. It’s more of a headache now than a journey. Password works in Ancestry, but in DNA I'm stuck in a "switch accounts/enter password" loop. So much fun! Best birthday present ever! This test… doesn’t work. I had some really high hopes about finding out a lot more details about the places my genes come from, but I also decided to do the genetic traits add on test to see how accurate it was on measurable appearance based traits. Almost none of them were correct, even those that are easily identifiable and pretty well established in other genetic tests (i.e. hair or eye color, earlobe shape, cilantro aversion.) In addition, the ethnic origins directly contradict the majority of well documented history in my family genealogy in ways that are quite literally impossible. Lastly, I was still excited to see some of the detailed regional breakdowns, but I just got some wide regional guesses and generic Wikipedia information about a few countries. I would go ahead and splurge on a more reputable test like 23 and Me instead of going for this. Brought the kit when it was on a promotional deal so with taxes it cost about 71. Results came back really quick. They received the kit March 27, got the results back April 7. I’m surprised of the outcome of the results, I knew some of my background bit not everything. I highly recommend this company if you truly want to know your history culture & where you come from.